The flag of Portugal (Portuguese: Bandeira de Portugal) is the national flag of the Portuguese Republic. 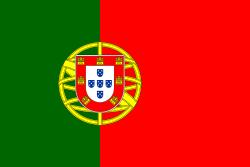 It has a vertical bicolour of green and red, with the lesser coat of arms of Portugal centred over the colour boundary. This page was last changed on 20 January 2019, at 20:19.